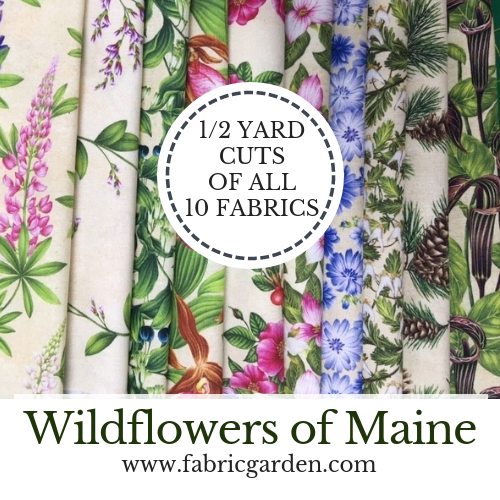 TEN ASSORTED HALF-YARD CUTS of Wildflowers of Maine Digitally-Printed fabrics. One Half-Yard of each of the ten fabrics created exclusively for Maine Shop Hop 2019 Exclusive Maine Quilt Shop Hop fabric. 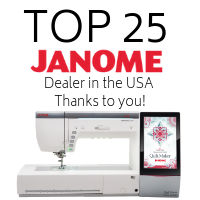 Wildflowers of Maine digitally-printed fabrics are exclusive to shops participating in Maine Quilt Shop Hop 2019. Maine Shop Hop fabric depicts wildflowers native to our beloved state (and sometimes beyond!). Each wildflower has been beautifully illustrated to capture its beauty. 100% cotton, 42-44" wide.